I did this last week for the first time. 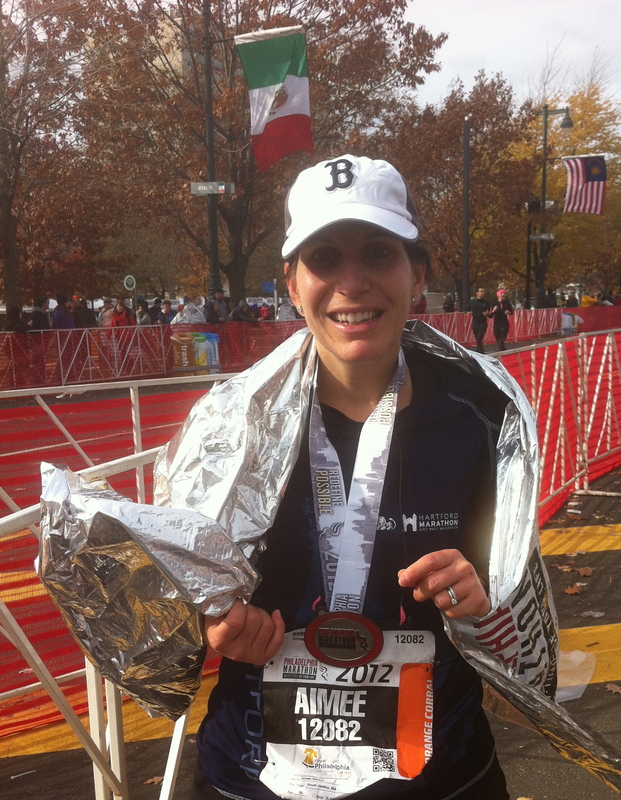 I tend to be a day behind because I always post my marathon training recap on Monday. I tried to get this up last night, but I didn’t happen. If you’re new to Friend Makin’ Mondays, please answer this week’s question on your own blog then add your link in the comments section here at: www.alltheweigh.com so everyone can see your FMM questions and answers. The idea is to connect with other awesome bloggers so after posting your own FMM post on Kenlie’s page take some time to comment on a couple of other posts. Here is this week’s topic! 1. Do you like to shop? I do like to shop. I don’t always feel like shopping though. I have to be in the mood for it. 2. Have you started Christmas shopping yet? No I haven’t. I can’t seem to get organized this year. I tried to shop some of the Cyber Monday sales but I had so many other things to do today. 3. Did you shop on Black Friday? if so, what did you buy? No I had to work Thanksgiving night. Although even if I didn’t have to work I wouldn’t have gone shopping. It’s madness out there! 4. List a few of your favorite stores. Don’t laugh but two of my favorite stores are Whole Foods and Trader Joe’s. I could spend hours browsing through Whole Foods. I also like Target, Loft and Ann Taylor. Those are stores I actually shop in. Then there are stores like Williams-Sonoma and Pottery Barn that I basically just browse in. 5. What is the last thing you purchased for yourself? We went to Kringle candle over the weekend and I bought some candles. 6. Do you prefer to shop in-store or online? I love the ease of online shopping but I hate paying shipping charges. If I can get free shipping then I usually buy online. I don’t buy clothing too often online because it can be a hassle to return. Amazon is one of my favorite places to shop online. 7. If you could purchase one thing that you don’t need at all for yourself today, what would it be? If money were no object I would buy myself an iPad. 8. Does your significant other shop with you? Not usually but it is because of our schedules and childcare. I like shopping with my husband. He is a great bargain hunter. Do they love it/hate it? My husband likes to shop but leaves the gift buying up to me. 9. Do you shop at thrift stores? I haven’t in a while but I always have fun when I do. 10. When your holiday shopping do you make lists? I make lists for everything. Google Tasks is my favorite list maker. Yes I definitely have a list of people I need to buy Christmas gifts for. I also keep a list of gift ideas for people throughout the year as they mention things they might like. I’m just going to get right into it. I weighed myself this morning and I was shocked. Then I left for my solo turkey trot. I ran 10 miles at the reservoir this morning. I did the same thing last year and I’ve decided to make it a tradition. I did a lot of thinking on that run. At first I was angry, angry at the scale, at myself, at my body. Then the anger turned into a string of justifications. I’m PMSing. I’m running more. I ate more than a few of the treats I baked last night for Thanksgiving including Mama Pea’s Peanut Butter Cookie Dough Balls and Chocolate Chip Cookies with Sea Salt. Vegan does not equal fat free, but it does equal delicious. Try them you won’t be sorry, but only try one or two then give them all away. I probably won’t lose 10 pounds by the end of the year. That’s ok. I will lose it after the marathon. The scale is not going away yet because this is a challenging time of year. Food is everywhere and not necessarily healthy food. There is a party every week it seems between now and Christmas. I no longer see the holidays as a time to indulge and lose sight of healthy behaviors. I have worked very hard to maintain this weight that I am at for over a year and I intend on staying here until the marathon is over. If I end up losing a pound or two great. I suspect that the 162 is largely due to a bit of water retention and if I’m correct then the scale will return to the 160 it seems so comfortable. I may not meet my Holiday Challenge goal, but the challenge has helped me to meet other bloggers, stay focused on portion sizes, and be cognizant of what I’m eating despite all the miles I’m running. My weight loss journey is far from over, but at least I’m no longer waiting for it to end. I’m out there running and strength training, playing outside with my son, baking and cooking more and more healthy recipes that are whole food and plant based, eating a rainbow of colors and enjoying it. I’m happy, healthy and I have more energy than I have ever had before. My beautiful son Carlos tops my list. He makes me smile and truly makes me want to be a better person. When I run I do it for both of us. I want him to grow up with a healthy, happy Mom and I want him to know he can do anything he sets his mind to. My handsome husband Orlando is next on my list. We celebrated 10 years of marriage in September and it has been wonderful. I love him very much. Breaking my rib in September…weird right?! I know it sounds crazy, but in a strange way I’m grateful for the experience. It reminded me of how I take my good health for granted sometimes. It taught me to listen to my body and treat it with care. It also proved to me how incredible the body really is and how deserving it is of excellent nutrition and fitness. My job. I’m lucky to have a job and even luckier to have a job that I really like. I have to work tonight and I don’t even mind. I’m looking forward to seeing the girls I work with. We generally have an enjoyable time no matter what. Running. I promise to not get all sappy about how running has changed my life so I’ll just leave it at that! I am also very thankful for those of you who have been visiting my blog and leaving kind, encouraging comments. Thank you so much. I hope you all have a wonderful Thanksgiving. OK I know it’s really Tuesday. I read about Friend Makin’ Monday (FMM) on Carrie’s blog late yesterday and I really wanted to participate. The idea is to answer a question of the week on your blog, then post a link to your response on www.alltheweigh.com. This is a great way to discover other blogs out there. This week’s question is fitting given the upcoming holiday. I love to hear how others celebrate holidays. My family always celebrates Thanksgiving at my Mom’s house. She cooks a huge dinner with all the usual fixings, turkey, gravy mashed potatoes, sweet potatoes, vegetables and lots more. I am from a big Italian family so no holiday meal would be complete without some kind of pasta. This year it will be stuffed shells with homemade marinara sauce. The dessert table boasts pumpkin pie, apple pie, Italian cookies and various other treats. There is always way too much food. Sadly we don’t have any family traditions other than eating dinner together. My parents divorced when I was ten years old. As children, my sister and I would spend the morning at the local high school football game. In my college years while living off campus I often rolled out of bed in the late morning hours and drove home just in time for dinner. I missed four Thanksgivings while living in Mozambique as a Peace Corps Volunteer. There was usually some kind of celebration in honor the of the holiday. The American volunteers would get together at someone’s site and create a Thanksgiving feast to be shared with Mozambican friends. Upon return to the United States in 2002 Thanksgiving is still hosted by my Mom. I started my own tradition two years ago and I treat myself to a run on Thanksgiving morning. Last year I made it a 10 mile run and I plan to do the same this year. There are no Turkey Trots or other races in my area so I just get out there and run on my own. The best part is that I can taste a bit of everything including dessert later on at dinner without feeling guilty. We have started urging my mother to allow more time between dinner and dessert. It was always eat dinner, quick clean up and then get dessert out. There was no time to relax and digest. Now my sister, my son and I usually end up taking a walk after dinner if the weather is decent outside. For the first few years I worked as a nurse at the hospital I had to work both the Wednesday night before Thanksgiving and the Thursday night of Thanksgiving. Once in 4 years I had the Thursday night off. Since transferring to the unit I work on now I either work the Wednesday or the Thursday night, but not both unless I choose to pick up the extra shift. This year I am working Thursday night but I don’t go in until 11pm so I won’t miss anything. My food tastes have certainly changed over the years. I no longer eat meat, though I was never a huge fan of turkey and I know that I skipped it most Thanksgiving in favor of the delicious side dishes. I like to bring a side dish and a dessert that are somewhat more healthful though I haven’t decided what to bring yet. I love Thanksgiving. It is my favorite holiday by far because there is no commercialism attached to it, just pure family together time. I hope you have a wonderful Thanksgiving. I look forward to reading about how others celebrate the day.